The robust demand for sludge elimination technologies across the globe is certain to drive industrial sludge treatment chemicals market in the forthcoming years. In an era dominated by industrialization and urbanization, the accumulation of industrial wastes is way too self-evident to be ignored. Given the ongoing urgency to promote environmental safety, eliminating destructive wastes is being prioritized by companies, which has given rise to numerous wastewater treatment plants across the globe. However, this practice of waste disposal leads to the accumulation of a massive proportion of sludge, demanding the deployment of sludge treatment methodologies, which would eventually propel industrial sludge treatment chemicals industry share. In essence, it would be justified to state that the prevalence of wastewater treatment facilities is directly proportional to the expansion of industrial sludge treatment chemicals market. As the scope of industrialization depicts an exponential rise in the forthcoming years, the growth potential of end-use sectors such as oil & gas, food & beverage, automotive, and energy would exhibit an accelerating boost as well. In consequence, this would enable the establishment of numerous wastewater treatment units, which would provide a boost to industrial sludge treatment chemicals market share in the years to come. Similar trends are already being depicted across industrial sludge treatment chemicals market – for instance, the Jospong Group of Companies in Ghana has recently partnered with the Hungarian water resource technology company, Pureco Limited, to construct a customized wastewater treatment plant in Kumasi, for solving the sanitation problems of the city and treating the liquid waste generated in the region. The EUR 7 million project has already gone on floors and would see the light of the day by the beginning of the third quarter of 2019. In fact, post the construction of this plant, plans are being formulated to commence more facilities in other parts of the country. The establishment of numerous such wastewater treatment units would lead to the accumulation of a mammoth percentage of sludge, which would demand the usage of coagulants and flocculants for effective treatment. The repercussions of the same are likely to be portrayed on the revenue graph of industrial sludge treatment chemicals industry, the size off which stood at a valuation of USD 4.5 billion in the year 2016. A rather pivotal niche vertical, the personal care and chemicals sector is tagged as one of the most lucrative application arenas of industrial sludge treatment chemicals market. The personal care sector alone, as per reliable estimates, currently amounts to more than USD 90 billion. As the trends of beauty and body care have been gaining mainstream prominence, chemical companies have been going the whole hog to develop ingredients that are necessary for manufacturing personal care products. In an effort to keep pace with the expanding personal care sector, firms operating in the chemical realm have also been striving to achieve high quality in product development, in the course of which they have been experimenting with numerous tried-and-tested as well as novel formulations, leading to the accumulation of substantial industrial waste. In order to successfully eliminate the waste, chemical factories often have an attached waste treatment facility on the brink of the production site, prompting the necessity of sludge management strategies, which in turn would provide a slew of opportunities for industrial sludge treatment chemicals market giants. According to a recently compiled report, industrial sludge treatment chemicals industry share, driven by an impressive rise in the usage of grooming products, is expected to register a CAGR of more than 6.5% over 2017-2024. Not to mention, the rising demand for luxury personal care brands will drive the sales for skin care & hair care products, fragrances, toiletries, and anti-aging products across myriad geographies. 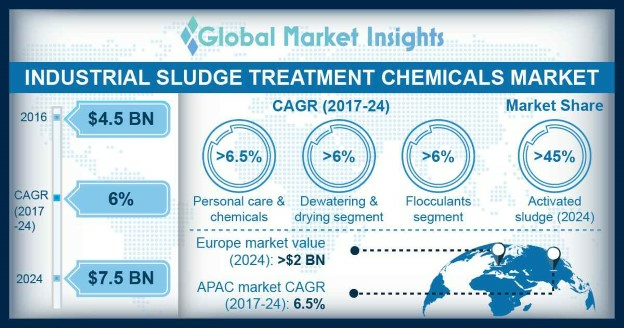 Supported by a favorable regulatory framework with regards to chemical waste management, industrial sludge treatment chemicals industry size from the personal care sector is likely to soar high in the years to come. The vast expanse of the application spectrum of industrial sludge treatment chemicals industry is a clear indication of the extensive growth potential of this business sphere. As the global population is estimated to soar beyond 9.5 billion by 2050, the demand for industrial goods is expected to grow more intense, leading to the establishment of a good many waste and sewage treatment facilities. Furthermore, the contribution of regional governments and authorized bodies toward waste treatment has a pivotal role to play in transforming industrial sludge treatment chemicals market trends. Quoting an instance, recently, the Kingston City’s Common Council authorized the official reroofing of the wastewater treatment plant on East Strand as a part of the upgradation policy for the facility, which is expected to have a prominent influence on the regional industrial sludge treatment chemicals industry. The renovation is expected to commence by the end of 2017 and would be completed within a year, within a modest budget of USD 264,210, substantially improving the performance of the plant. In consequence, this would have a commendable impact on the overall industrial sludge treatment chemicals market outlook. The incidence is also indicative of the fact that favorable initiatives undertaken by commissioned organizations would indeed have an influence on industrial sludge treatment chemicals industry size, which is expected to register a CAGR of 6% over 2017-2024.